Perfect for the lazy Earth-lover. Gardeners like perennial flowers because you do the work to get them established once and they bloom again and again. There are numerous perennial vegetable perennial vegetables as well but they lack the same recognition. Asparagus is by far the most well-known; from there the list quickly becomes obscure. But it is a beautiful world to discover, featuring crops like capers, chayote, and tree collards, which give year after year with minimal effort on your part, much like a fruit tree. Perennial vegetables are not only a boon to hands-off gardeners but they benefit the environment as well. Tilling the soil to prepare it for annuals unleashes a litany of ecological no-nos: It exposes the soil to the erosive forces of wind and rain, releases carbon dioxide into the atmosphere, dries up the soil, and wrecks the soil food web for starters. Perennial crops are compatible with no-till cultivation, which reduces moisture loss, encourages biological activity in the soil, and promotes that crumbly, spongy texture that all farmers and gardeners strive for. The part we eat is the unopened flower bud of a giant thistle plant, which stands like a spiky silver-grey sculpture in the garden. 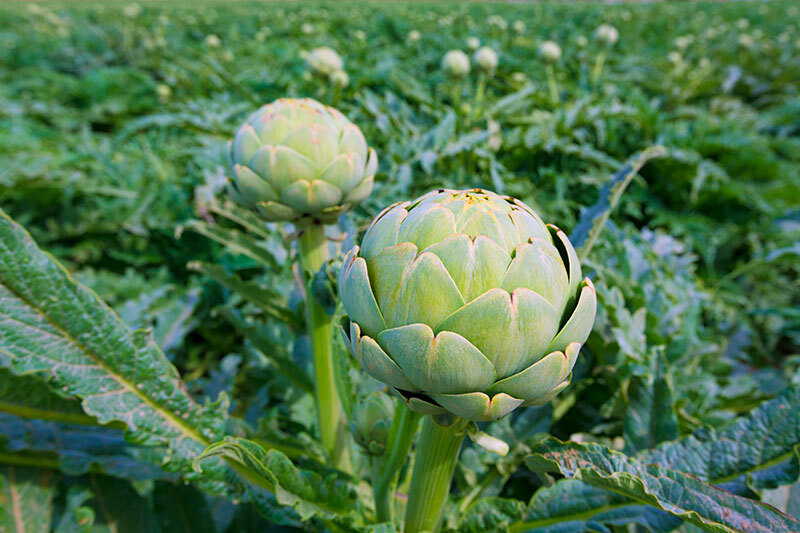 Artichokes grow slowly from seed, so most gardeners plant them as root crowns, divided from a mother clump. It is the thick red leaf stalks of the rhubarb plant that are used to impart a tangy flavor to pies and preserves. Rhubarb leaves are poisonous. 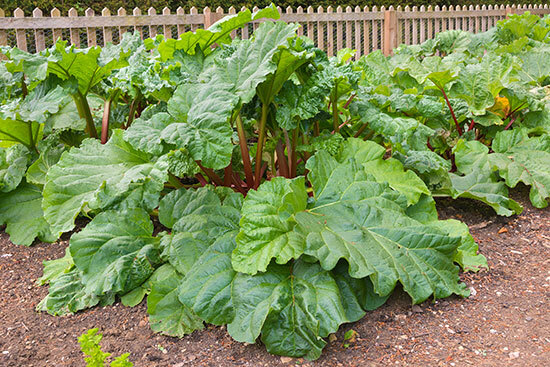 Like artichokes, rhubarb has showy foliage and is generally grown from root crowns. Americans would be lucky to stumble across this one in a grocery store, but in France the zingy, slightly bitter flavor of the greens make them an immensely popular vegetable. 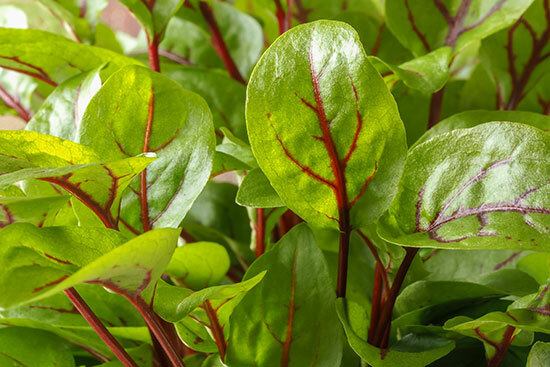 French sorrel forms a tidy, lush clump in the garden, and likes to grow in a place with a bit of afternoon shade. Typically grown from seed. Chayote is that nondescript fist-sized vegetable you’ve probably seen in Mexican bodegas and increasingly in typical supermarkets. 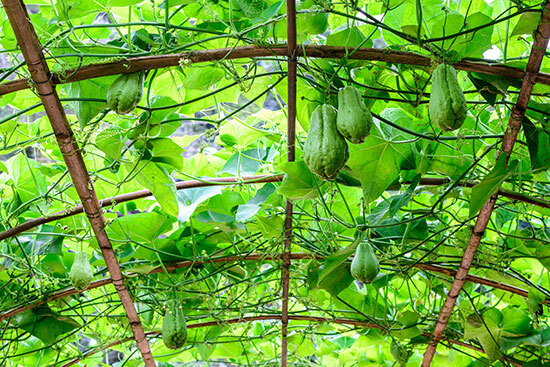 It’s produced on an enormous squash vine that can grow 20 feet or more in a season (it will die to the ground in winter). Plain chayote is pretty bland – it’s all about the spices you cook it up with. Buy one at the store, plant the entire thing a couple inches below ground in spring, and watch it sprout from the enormous seed inside. Like artichokes, capers are one of the select few plants grown for its edible flower buds. If you let the flower buds open, caper berries eventually form. Either can be pickled in a salt and vinegar brine – the famous ingredient of many Mediterranean dishes. 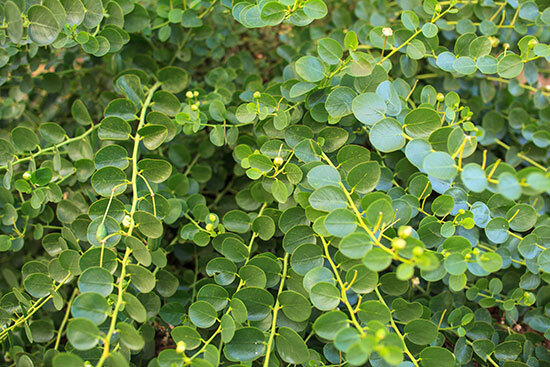 The spiny, low-growing shrub that produces capers only grows in mild winter climates, and dry-ish infertile soils, such as those in the barren hills of Northern Africa and southern Europe where it originates. Seedling caper plants are available online. Bamboo is another example of a perennial plant that is both beautiful and edible, though some types of bamboo taste much better than others. The shoot must be harvested just as it emerges from the ground, no more than a few inches tall; otherwise it is tough and acrid. 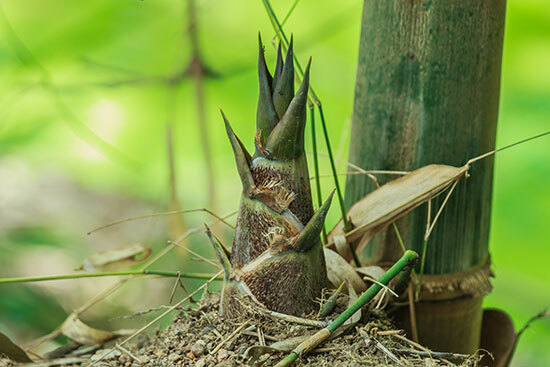 Many species of bamboo contain poisonous compounds, though these are neutralized with boiling – thus, always boil bamboo shoots before consuming. Moso bamboo (Phyllostachys edulis) and sweetshoot bamboo (Phyllostachys dulcis) are the types most commonly used. This long-lived brassica crop has a cult following among permaculturists, who hail it as the granddaddy of perennial vegetables. 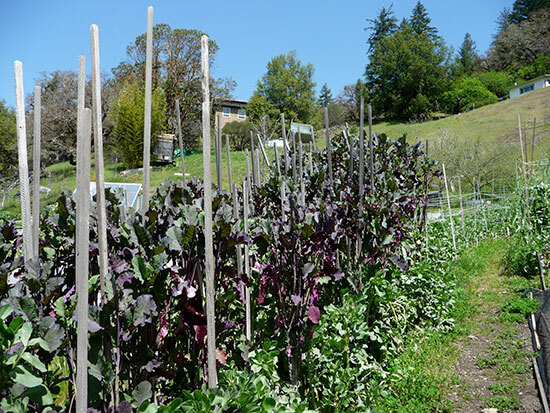 The flavor is sweeter and nuttier than either collard greens or kale, and it persists indefinitely in the garden, needing nothing more than to be cut back once per year. Tree collards are an odd plant that never goes to seed, so it is grown exclusively from rooted cuttings. 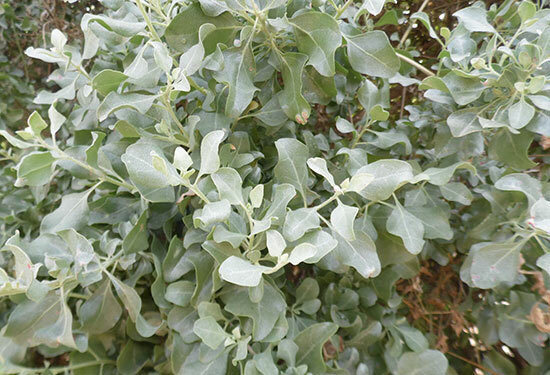 Sometimes called orach, saltbush is a spindly shrub that grows in many desert and seaside regions of the world, though it adapts to other environments if given dry, well-drained soil. The spinach-flavored plant accumulates salt in its tissues, so there is no need to add table salt when cooking. Its tiny red berries are considered a delicacy. Grow from seed or look for potted plants online. 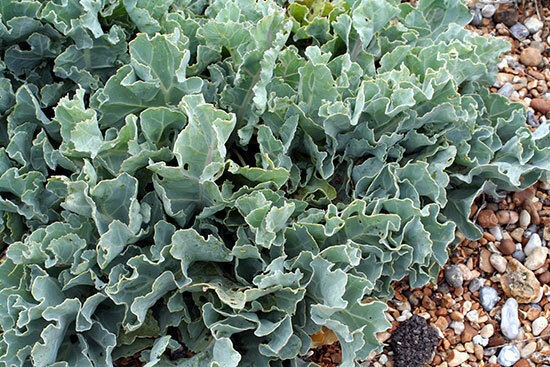 Another halophyte – the botanical term for plants capable of growing and salty soil – sea kale is native to coastal regions in northern Europe. A popular vegetable in Victorian England that has since fallen out of style, it looks and tastes much like ordinary kale, but is a perennial. It is easy to grow from seed in ordinary garden conditions. What? How could you possibly eat a plant that stings you? Easily enough: The tiny hairs on the underside of stinging nettle leaves, which cause a mildly painful experience when your bare skin brushes up against them, are rendered impotent upon cooking. Just be sure to wear gloves when you harvest them. The nutrient-rich leaves have a decadent nutty flavor, useful for soups, stir-fries, omelettes, and even pesto (running the leaves through a blender also neutralizes the stinging hairs, though most nettle pesto recipes call for lightly cooking the leaves just to be sure). 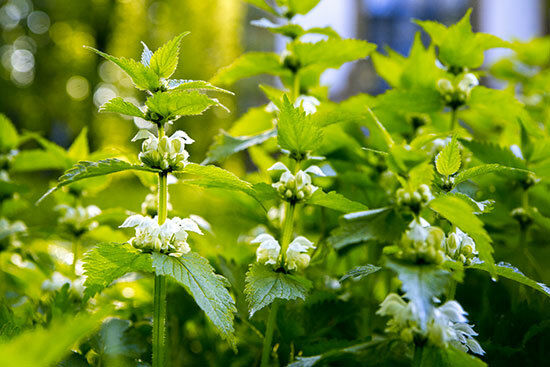 Stinging nettles may be grown from seed, but it’s much easier to plant root cuttings.